Are you facing losing one or more of your teeth? Maybe you’re a victim of a dental accident and knocked several teeth loose, what’s next? Dental implants in Bonita Springs may be just right for you! Our dental experts at Pelican Landing Dental are going to discuss how many teeth just a few dental implants can actually replace and how the process works. Before you know it, you’ll totally forget about missing any teeth! Dental implants are the revolutionary way to replace damaged or missing teeth. 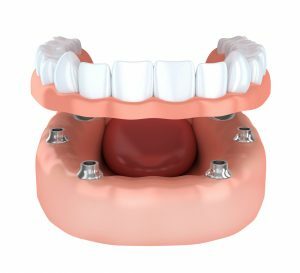 This restorative option offers unique benefits compared to traditional tooth replacement options. Common tooth replacements like crowns or bridges replace the crown (visible portion), but they ignore the other very important part of your tooth – the root. Your tooth root stimulates your jawbone, keeping it strong, full, and healthy. Without the stimulation of healthy tooth roots, patients experience jaw bone deterioration over time, leading to an increased risk of additional tooth loss or a sunken facial appearance. Thankfully, dental implants replicate the entire structure of a tooth including the crown and the tooth root, encouraging the growth of new bone tissue. One way a dental implant is commonly used is replacing a single tooth. During this procedure, your biocompatible titanium implant post will be placed in your jaw where your natural tooth once was. Once it heals and fuses with your body, your implant dentist in Bonita Springs will attach an abutment and dental prosthetic! You will have a tooth that looks and functions just like your natural teeth in no time. Even though you may need two teeth to be replaced, this dental problem can be easily addressed with just a single dental implant. The only difference is that two prosthetics will be attached (tooth-colored crowns or a bridge) to fill the gap. In the case that you have two missing teeth that are not close to each other, you will need to get two separate dental implants. This same process can be applied if you’re missing three or four consecutive teeth. The only difference is that two implant posts will need to be placed on both ends of the gap. This way, your dental bridge will be stabilized on both sides. If you’re missing teeth throughout your mouth but not consecutively, you can replace them with a custom-designed partial denture. This dental prosthetic can fit in between your permanent teeth just like the perfect puzzle piece. The best part is that instead of having to use clasps or unpleasant adhesives to keep your dental prosthetic in place, our dental experts can support your dentures with strategically placed dental implants. Pelican Landing Dental can also securely place a full set of dentures to restore a full arch of missing teeth. Usually, you would have to deal with certain inconveniences with full sets of dentures like slippage, jaw bone deterioration, and unpleasant adhesives. But with dental implants, they will simply snap onto your implant posts! As you can see, it doesn’t matter how many teeth you may have left. That doesn’t get in the way of our dental experts helping you restore your smile with dental implants. If you have any questions or if you’re interested in how you can benefit from dental implants, give us a call today.